Isabelle. Bit of Earth Farm. I stuff my pockets with carrots before heading out back. 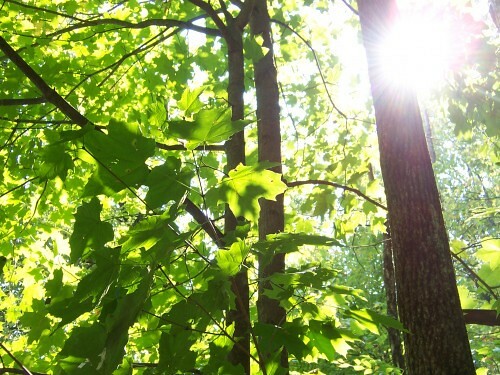 Pausing at the garden, I pull rutabagas and flowering broccoli, then walk past the creek and up the tree-lined path. Chickens wander alongside to see what I’ve brought. Although my arms are nearly full, I bend to pick plantain before opening the barnyard gate. Isabelle is in the side pasture with her two calves. I walk to her, rutabaga leaves waving in time to my steps, as she hurries toward me with the lumbering grace of a matronly Guernsey. Like shy but exuberant dancers, her calves follow in leaps and half-turns, their eyes bashfully averted. Isabelle takes the food from my fingers gently, her soft lips brushing my skin. When I fumble, she waits patiently, drooling in anticipation as I snap the next carrot in half. A few weeks ago, during our evening-snack ritual, she dropped a mouthful of food, refusing to touch it again, yet took the next handful I offered. Later, I realized that morning glory was growing in the patch of clover I’d picked for her. Isabelle had immediately detected the presence of a plant toxic to her heart. The calves watch their mother eat. Tentatively, they lean forward to touch rutabaga leaves with their noses. Although curious, they prefer their mother’s milk. Their idyllic lives — out on pasture with their mother, nursing on demand — are rare on today’s dairy farm. 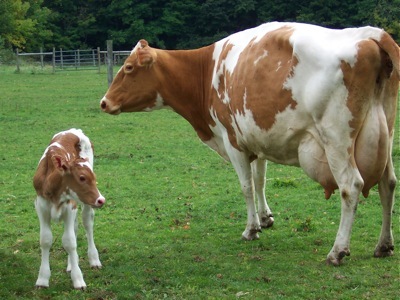 Most dairy calves are separated from their mothers soon after birth. It’s considered more cost-effective to give the calves something called “calf milk replacer.” But this white fluid resembles cow milk only to lab analysts, as the ingredients may include wheat, soy, lard, fish, and animal plasma (often from pig blood). When we were new to farming, everything we read warned that a calf left with its mother to nurse freely was likely to develop scours, a potentially fatal condition. We couldn’t imagine that nature had it wrong and agriculture manuals had it right. Besides, we had no intention of separating mother from calf. A little research showed that the experts were looking at it the problem upside down. Scours is more likely to happen in calves taken from their mothers so soon that they’re deprived of the antibody-rich colostrum that flows from their mothers’ udders right after birth. Isabelle is an attentive mother. She teaches with nudges, head movements, and a variety of vocalizations. She stands still when her calves choose to nurse, moving no more than her tail to flick away flies. Each of Isabelle’s calves has been significantly bigger than the average for her breed, with no medical problems. And we’ve always had more than enough milk for our human family while she nurses a calf or two for a year. On our farm, the bond we witness between cow and calf forces us to recognize the toll taken by standard agricultural practices. One day, we were at a nearby dairy when farmhands came to take a day-old calf from its mother. As the men approached, a dozen other cows in the pen formed a circle against them, keeping the mother and calf in the center. After losing the struggle to protect one of their own, the cows began bawling, and soon the cows in the other buildings joined in. We could hear them as we drove away. All around us, dairy farms isolate calves in “calf huts,” where they’re fed calf milk replacer. Most often, their mothers live confined indoors, their sensitive noses smelling their own calves and green grass, both forever beyond their reach. Our veterinarian tells us that in 26 years, he’s never seen dairy calves raised alongside their mothers except on our farm. He remains astonished by what he regards as the uncharacteristic size and robust health of the calves here. Isabelle belches appreciatively. It smells like the hay we harvested last summer. Gas emissions from both ends of cattle have been blamed for contributing to global climate change. But studies indicate that the net effect of grass-fed cattle actually slows global warming. Confinement farming and unnatural feeding are the problem. Cattle have evolved to thrive on nothing but grass and its dry counterpart, hay. It’s another of nature’s miracles that cows can grow so large and produce such rich milk purely from grass, a plant inedible to humans. Yet according to Jo Robinson’s book Pasture Perfect: How You Can Benefit from Choosing Meat, Eggs, and Dairy Products from Grass-Fed Animals cattle on today’s farms are fed diets heavy in grains, protein supplements, and bulking agents such as cardboard, chicken feathers, and stale candy. Even plastic pot scrubbers have been used to replace the roughage that simple grass naturally provides. These artificial diets cause a range of physical disorders, so the typical cow diet is further adulterated with synthetic nutrients and medications. Pastured cows have fewer reproductive problems and produce larger, healthier calves. The more fresh grass a cow eats, the more vitamin E, omega-3 fatty acids, and cancer-fighting conjugated linoleic acid (CLA) she’ll produce in her milk. In fact, the older a cow gets, the higher the CLA levels in her milk. But dairy cows in this country don’t live long. They’re culled at three, four, maybe five years old. Overproduction, unnatural diets, and confinement make them unprofitable after that age, even though cows can easily reproduce and give milk well into their teens as we learned from Joann Grohman’s Keeping A Family Cow and her family cow forum. Isabelle is nearly 12 years old. She chooses to spend most of her time outdoors. She’s curious about anything new going on nearby, and mindful of chickens pecking underfoot. Such curiosity is typical of her kind. Even animal researchers have been surprised to discover cattle have “eureka” moments when solving problems, a moment so gratifying that some cows leap in the air. Isabelle, though a middle-aged lady, regularly indulges in those leaping moments. She scampers girlishly, tosses her head, and runs in sheer pleasure. When she lies down to rest, she lets the barn cats sleep on her warm hide. Isabelle chews slowly. Her teeth crunch on broccoli and her tongue flicks out to catch a wayward cluster before it falls. Cattle seem to be contemplative eaters. Given free pastoral range, they select grasses with high nutrient levels, instinctively self-medicating with the right plants when ill. They choose to graze alongside favorite herd mates, just as we prefer lunching with friends. After eating, they digest as all ruminants do, chewing their cud to enjoy the meal all over again. My hands are empty now. I stroke Isabelle’s face and manage to rub the nearest calf’s hide. Soon they’ll wander back to the shady part of the pasture together. There they’ll eat grass, or milk made from grass, eating within the perfect circle of sun, soil, and sustenance. The calves will nap under an apple tree’s long shadow and Isabelle will bring up rutabagas, broccoli, and carrots to chew again, a reminder of a meal offered by loving hands. This article was first published in Culinate. Isabelle is 15 years old now, still producing milk and nursing her current calf. This entry was posted in agribusiness, animal relations, cattle, farming, grassfed, pastured dairy, rural life and tagged family cow, gentle dairy farming, homestead dairy, how to raise a cow, humane farming, kindly dairy practices, pastured dairy, raising calf with mother. Bookmark the permalink. I love this~! Soothes my soul, Laura Grace. Thank you! Katherine, you may be the most affirming person I have met online. Thanks for being you! We bought Isabelle from a farmer who tended a small dairy herd and knew his animals well. He specifically chose a calm animal he felt would do well without a whole herd around her. I suspect that sort of selection is also important when raising a family cow. Keep dreaming of farming Tereza! What a lovely tale of Isabelle and her calves, and of your care for them. Thank you for letting us get to know about the ways of this gentle and curious creature. I truly believe that every creature naturally enjoys being alive, and all farm animals should be able to move about freely outdoors and do what is natural to them. Very glad to have met your family and learned of Isabelle and her gentle ways. And the idea of cows having “eureka” moments. Wonderful. My life-long love of cows is now deeper. Interesting what animals we’re drawn to isn’t it Lesley? I wonder why cows mean so much to you. You can find cattle in mythology and scripture from many parts of the world, maybe you’ll find a clue there. Much gratitude for this lovely article! I Googled “cows raised kindly”, looking for a compassionate cow carer like you! Now if only I could find one nearby to have some milk from…. I love the search term you chose David. Keep looking, surely you’ll find a farm near you. Then ask to visit! After reading about sad factory farms and the horrid life of dairy cows and calves, your life with Isabelle and her family almost made me cry. Thank-you for your beautiful kindheartedness and humanity, you’re an oasis in the desert. My friend’s Italian grandmother used to repeat a phrase that stays with me. “Each one, everyone.” I’m not entirely sure what it means but I think it has something to do with acting as we want everyone to act. I live in rural North Carolina and I have been planning a little self sufficient farm for a long time. I absolutely love your blog. Keep inspiring us! Lovely. I’ve always wanted to have a Jersey house cow, but lack the space – and indeed the right number of mouths to consume the output! I love that you clearly adore your cow! Oh how I love cows. This makes me miss having a milk cow so much and long for one again. A couple of questions: what do you do with the male calves born? And what about when the females’ milk supply dwindles? Do you send them to slaughter? This is how deluded we were when we started this venture some 15 years ago. Vegetarian me thought we could sell male calves, once weaned, to nearby Amish farms to use as oxen. No, no you can’t. They plow with horses and if they wanted oxen they’d train their own steers. And the male calves of dairy cows are worth very little, something like $50 to $80 bucks around here. So, when male calves are born, we do the very kindest thing possible. We keep them with their mom, nursing on demand, out on pasture as they choose – until they’re about two years old. Then, because we can’t afford to keep them any longer, they’re sent directly to a local butcher where they’re slaughtered (never held in a feedlot for weeks to bulk up). Their meat is very high in nutrients and very tender, so I’m told. It’s a hard reality. But as one friend (who hasn’t eaten beef in years except from our farm) said, eating an animal that has been cared for tenderly and raised as close to nature as possible is, to her, like a sacrament. As for milk, we raise cows as part of our homestead. We keep mom cow with her calf during the day and evening to nurse on demand, separating them only at night (they can see each other and nuzzle through the stall slats even then) so that there’s enough supply built up for us to milk in the morning. That keeps us from having too much milk while giving calves the very best nurturing. At freshening, we get around 4 gallons per milking. This goes down gradually until we’ve getting something like two and a half to three gallons a day. This is more than enough to have liquid milk as well as make cheese, yogurt, kefir, etc for one family. We’ve never sent a female calf or cow to slaughter. 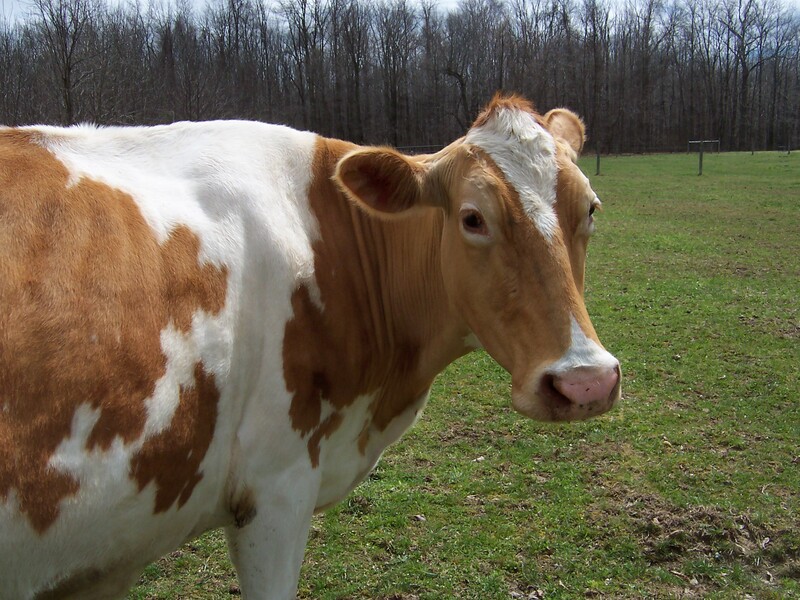 Our original cow, Isabelle, is now 17 years old. Do you milk just once a day then, in the morning when the milk has built up? We have a Jersey that is due to have her calf in two months. So, we are anticipating how we will handle things. Yes, first thing in the morning, not stripping her entirely, then let the calf out to nurse on demand all day. Interesting. I think I may try this! How soon after birth do you resume milking? I assume it’s exclusively for baby for a little while. Once the colostrum is gone, three to four days at the earliest. I am so happy I just chanced upon your blog! What an eloquently written, inspiring story chalked full of useful information. Quick question. Can you point me to a post of yours (if you have one) or otherwise answer this question: What do you do with your mother cows calves once they grow up? Do you leave them to graze on the land? Do you turn them into dairy cows? Do you end up eating them? And if you do how does that effect Isabelle? Thank you for your time! Ah Kelsey, it’s complicated. We’ve always kept calves with their mother, grazing on the same pasture together and letting them nurse for up to two years. We’ve sold heifers back to the same Mennonite farmer and others in his community over the years. There have been steers born too. The truth is gut-wrenching to me, yet we’ve had no choice but to have them slaughtered. We keep them here until the last day so they don’t have to endure hours on a transport trailer, then days or weeks on a feedlot as is commonly done. I don’t want to minimize the effect on Isabelle or any other cow. It’s horrible and painful to separate a mother and calf when the calf is young. By the time any calf has left our farm, they’re as big or bigger than their mother. She’s clearly had it with them nursing or trying to nurse, often butting her offspring away with clearly “enough already” body language. We now have no more cattle on our land. After Isabelle passed away last spring I’m hoping to raise livestock that won’t ever become someone’s dinner. I’m thinking of fiber animals —- sheep and goats. Now all we need to do is save up to replace the pasture fencing that’s in pretty bad shape after all this time. Here’s a post (on my main site) about the paradox of loving animals that will, no matter what our hopes, end up being slaughtered. I am an ethical vegan but so appreciate that you recognize that a calf should be with its mother and chose to keep them together. Thank you being compassionate! It is my dream to have a Guernsey cow one day! Thanks for posting!